This entry was posted in Acadian, Appalachia, Canada, DNA, Micmac and tagged DNA. Bookmark the permalink. Found out through ancestry.com that there is 39% Native American ancestry, but was adopted in 1958. Unable to obtain adoption records identifying biological parents. How do we approach determining tribal relationships? Oh my gosh. That is my exact story. Adopted is 75 with no records. Got my ancestry results less than a week ago. I am 45% American Indian but as with you i have no backround whatsoever. I have the same question as you. Have you had any luck with those two websites the person suggested? Yes, I was provided with a couple of links on the topic. First, the point that was made most strongly is that the Native American nations aren’t really interested in increasing their numbers especially since that reduces their cut of cash from their now prosperous business ventures. Next, the actual genealogical records of your biological parents and relatives are the most reliable source and preferred over DNA, which really can’t be matched in their records, unless a blood relative who has also submitted their DNA to ancestry.com for example, and they notify you of those matches. So it’s really kind of a dead end as far as determining your specific lineage/tribe/nation. Having been adopted, raised an only child and with both adoptive parents now dead, we had hoped to learn more but it doesn’t seem possible. Finally, avoid those non-federally recognized tribes which are apparently very willing to take your money to be a member. 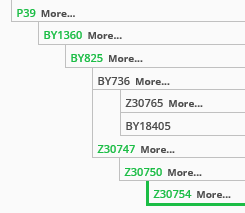 I have a second to fourth cousin match on ftdna with a person that is from the blue jacket line, and was part of a DNA project. I have not found the link yet and wanted to know if there is a good place for documents to find his link to me. I adopted but already know bio mom. There is a Shawnee Blue Jacket project. I would suggest that you contact the administrators who will probably welcome you and see what they can do to help. Hi Roberta! I fall under group C, but I can’t figure out specifically which sub group. Admittedly, I am having a hard time understanding it all. Where would I be able to find that under Family Tree? Your subgroup estimate is shown with your STR results. You can take a backbone test to refine, or the Big Y to in essence scan the entire Y chromosome. Hello, I have tested my Arredondo family line to the early 18th century. I traced them back to San Miguel de Aguayo (Bustamante, Nuevo Leon, Mexico). They were (according to church records) Alazapa Indians, an indigenous tribe of Nuevo Leon, believed to be under the umbrella of Coahuiltecan Indians. My predicted haplogroup is C-M216. I only did a Y37 to start. I am hoping to either get a SNP pack or Big Y in the future to refine it. I have only one match to a C-M217, which is understandable. I wonder if the Coahuiltecans are related at all to other Indigenous groups in the US? Related depends on timeframe. They are related in that they all descended from the group who crossed from Beringia. The question is when the various lines split. The Big Y is on sale now. Hi Roberta, I recently had a cousin DNA match at 23andMe with 21.5 % Native American, his haplogroup is C-Z30538 and his father is 1/2 Ho-Chunk Nation (Winnebago) and 1/2 French. My direct Native American maternal ancestor I believe was also Winnebago from the Wisconsin/Minnesota area. I am haplogroup B2. No matches except for my known close relatives. I sent him this website to get more information. I can send you his name via email if you would like it. Thank you. I hope he tests st Family Tree DNA and joins the American Indian project there.